< Charissa Rocks! The Unofficial Charissa Chamorro Website! In January 1999, the dynamic Charissa Chamorro joined the show "One Life To Live". In September 2001, joined the show "Guiding Light." While Charissa is a new talent to daytime TV she came out of the gate giving performances of a seasoned veteran. She's truly a talented performer and I'm honored to dedicate this website to her!! The site premiered in June 2000 (I think it was June) and since then we've had over 7,300 hits and earned two stars for Charissa from the STARPAGES poll. We're "Actress" "Celebrity" and "Women's Celeb" certified! The site is still expanding growing and I hope to make improvements in the upcoming year by adding a scoops page and a collages page. I can only hope that people who surf the net find the site an interesting place to learn about Charissa, enjoy the shows Charissa has been on and have fun here. Charissa is very talented and when I see that familiar smirk or that sad, wistful look on her face at the end of the scene, it's like a reward for watching her perform. CHARISSA ROCKS!! And so do you guys!! Big Thanks to everyone who has voted in the STARPAGES poll!! We've earned our second "Star" for a very talented performer! Now to vote for the site, you can click on the stars as well!! Good news! Fan Guides has checked out the site and loved it! They've given us their "Gold Award" and entered us in their award winning website Hall of Fame! Thanks everyone for your support. Keep voting for Charissa in the Fan guides poll! Well, Charissa's been busy in Cali looking for new roles and challenges. She's back in NYC now so let's wish her the best. This past year she had a role as "Kay" on Law & Order and hopefully we'll be seeing more of her on the small screen soon! April is Charissa's birthday month! 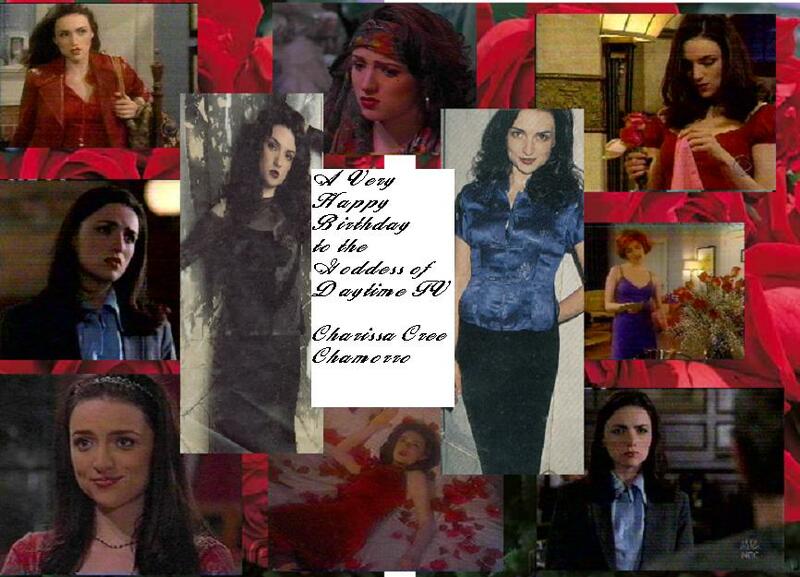 Sign in on the messageboard and wish Charissa a Happy Birthday!! Thanks again for everyone who checks out the site! If you get a chance vote in Fanguides and Starpages so we can get Charissa that 3rd Star! Drop a line on the site's messageboard. It's a good way to get feedback to Charissa! Sign in the Site's Guestbook and Let me know what you think of the Site & Charissa! If you enjoy my site vote in the Fanguide top GUIDING LIGHT fan sites, Starpages Actress Site and Coffeeroom Hot Mugs Site!! This site is not affiliated with ABC Daytime, Charissa Chamorro, or One Life to Live. Disclaimer: Under the U.S. Copyright Law, Section 107 entitled "Fair Use", this law entitles copyrighted material to be used only for educational purposes . I believe that all of the material on this website, including images, text (articles)from various media publications, is for educational purposes to inform the public, the fans of One Life To Live, about the characters of Sophia Pelligrino, and the actress who portrays her. This site is not affiliated with CBC Daytime, Charissa Chamorro, Procter & Gamble, or Guiding Light. Disclaimer: Under the U.S. Copyright Law, Section 107 entitled "Fair Use", this law entitles copyrighted material to be used only for educational purposes . I believe that all of the material on this website, including images, text (articles)from various media publications, is for educational purposes to inform the public, the fans of One Life To Live, about the characters of Sophia Pelligrino, and the actress who portrays her.